I've been racing lately on my midwestern lake in minnesota with my CS 17. I've been getting beat badly. I really fall behind during the first leg to windward. I make plenty of mistakes, but I also don't know for sure how far to "sheet in". I found this picture of a CS 17 going windward. I haven't come anywhere close to sheeting in this tight. Is this how the boat should look going windward? On my Lapwing I find that sheeting in more than the clew crossing inside side deck chokes the wind and any further weatherlyness (a real word?) is defeated by loss of speed. Pinching is seldom a good idea, even less with a cat/ketch. Once sheeted I concentrate on keeping the sails full but constantly testing the wind but trying never to go higher than a slight flutter at the luff of the main. A good starting point, Dave. Of course, the mizzen will be sheeted in closer than the main. A cat ketch is not going to point as high effectively as a well sailed sloop or cat. All the great handling manners of a cat ketch has a price and this is it. It should be looked at as a challenge to learn how to get the best out of your boat. Tom and Dave have given you good advice with the sheeting of the sails. Pinching is definitely not the way to go but so is sailing too full. There is another important adjustment and that is draft control which is adjusted by the snotter. I see a lot of skippers with way too much draft and pinching, complaining that their boats won't go to weather. The picture you posted of Paul's boat is close to what you want. As Wasserboot said you have to play with your adjustments to see what works best for the conditions. I would start in a moderate breeze and sheet the mizzen as Tom suggests and set it flatter than you have done before and sheet in the main also set pretty flat until the mizzen starts to backwind. Sail like this for a while and do a few tacks sailing as close as you can without pinching and see what speed your speed and tacking angle is. Then ease your snotters to draft up the sails in small increments to see what speed versus tacking angle is and then ease your sheets. You should now be on your way to figuring what your best settings will be for that condition. Lighter or choppier conditions will require you to sail a bit fuller. This is done by easing the sheets slightly and adding a little bit more draft. The other thing I want is to dial in about three or four degrees of weather helm. If the main has too much draft you can get lee helm and too flat will create weather helm as well as sheeting the main in too much. It will be the reverse for the mizzen. A bit of weather helm generates more lift than drag and it also encourages you to sail close to the wind as you will see the main start to luff when you lose concentration. Lee helm causes you to sag off to leeward which is not fast if you want to get to windward. Properly sailed, the cat ketch should be competitive around a course. Since that's me in the picture at last year's messabout, I'll add a few notes, all of which I think are consistent with the above. --The mizzen is indeed sheeted in hard, with the snotter set hard and the halyard/downhaul pulled hard. This means a flat sail as close to the centerline as I can pull it. On my boat, that's closer to the centerline than the gunwale. --The main is also set very flat. Halyard/downhaul taut, snotter taut. But it's sheeted with the end of the boom only to about the gunwale, so maybe not sheeted as tight as it looks, and definitely not as tight as the mizzen. --Note that these sails are set pretty flat even tho this picture was a light-air day, maybe 10 mph, if I'm remembering correctly. --Then the key thing, and the hard thing, is to keep all three of the telltales on the mainsail streaming freely aft when you're going upwind. This requires steady concentration. Once you find the sweet spot to set the sheet, you need to be watching ahead for the puffs and sailing the boat to match. --Head up in the puffs. Don't let the puffs overpower and heel the boat. CS wants to keep standing up, not get knocked. When the puff passes, then head off a bit, to keep the streamers streaming. --Meanwhile, if there is a "permanent" decrease or increase in the wind -- meaning anything more than a puff -- you'll need to adjust the mainsheet, probably, and your body position. You may even need to adjust the snotter/halyard/downhaul a bit to make the sail a little flatter or rounder if the bottom telltale is not streaming in the new breeze and if playing the sheet won't stream it. --Note a bit of heel, but not too much. This has seemed about right to me, with the lee chine biting and the weather chine out, but not much more. I'm trying to keep my weight centered fore and aft, to keep the stern up and the chine in at the bow. --I have the full-luff main with battens, which I think makes a large difference. I would suspect a large drop in upwind performance if you have the smaller sails designed to roll up on the mast. --I think it's better to reef and keep the boat upright in a blow, than to carry more sail and heel more. But my experience there is too limited for fully validated opinion. 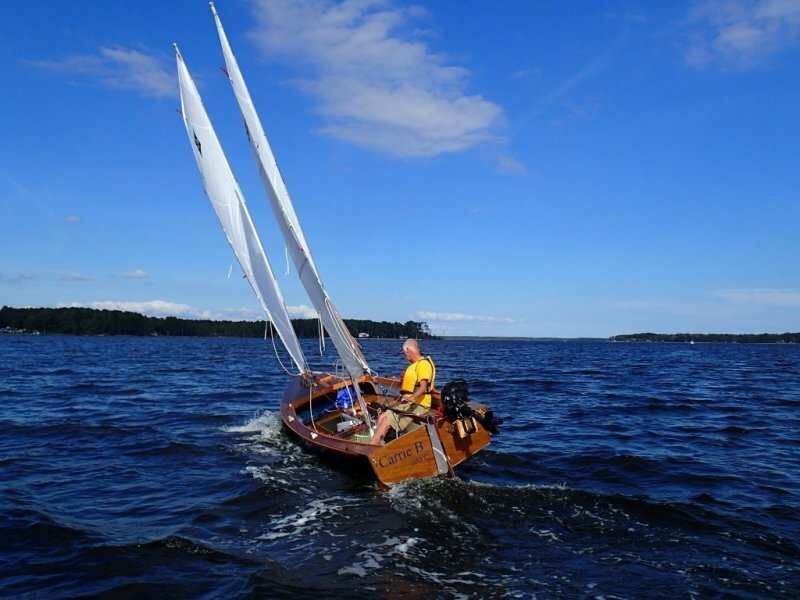 --A chop in the water as you head upwind will knock your boatspeed, especially if the bow is too high. You'll need to head off a bit to keep boat speed up at the expense of vmg. --So when do you use the snotter and halyard/downhaul adjustments? For (slightly) deeper draft when going cross- and especially downwind. As to your performance in the local races, against whom are you competing? If it's one designs with a lot of sail area, such as Thistles or Lightnings or scows, you can't hope to keep up, esp in light air. If it's bigger keel boats or centerboarders with longer waterlines, probably ditto. Just as one waterline example, Graham's CS 20 and CS 22 are noticeably faster than the 17. But if you're sailing against some of the smaller f.g. daysailers and such that weren't built expressly for one-design racing, like maybe O'Days, or against some of the other homebuilt designs, you should be right in there. Finally, see the posts in the topic below from Reacher and me on racing last weekend in Green Bay. It can be done!